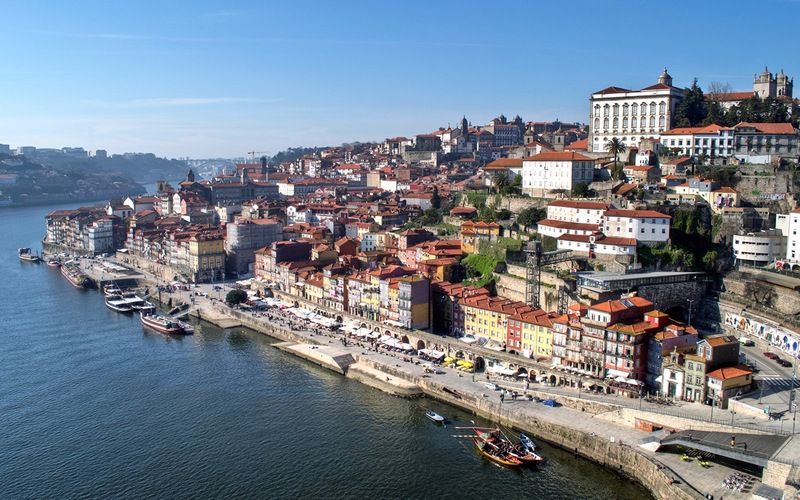 Porto is Portugal’s second-largest city, a modern metropolis home to 210,000 people, but the city’s heart still lies in its medieval old city – the Ribeira. 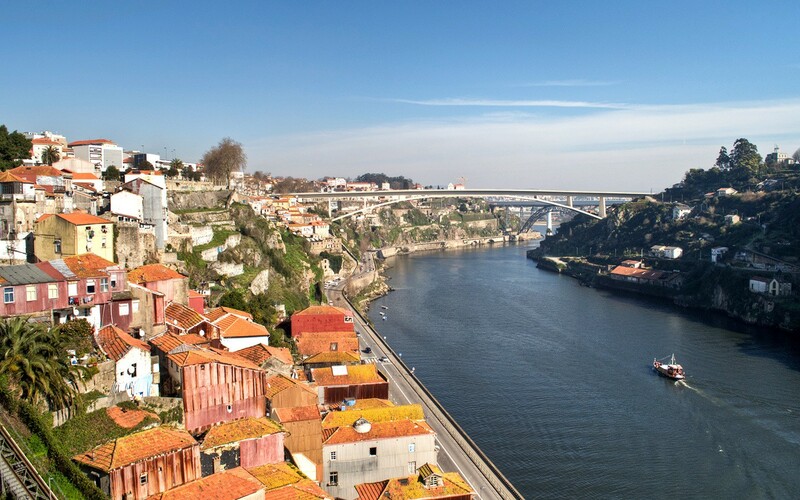 This historic district begins along the banks of the River Douro and spreads into the hills behind. As one of Porto’s oldest neighbourhoods, walking its streets is like taking a step back in time. It might be the city’s most visited district, but you can still lose yourself – and everyone else – in Porto’s old town. Straddling the River Duoro, the arching iron Dom Luís I bridge dominates Porto’s waterfront. 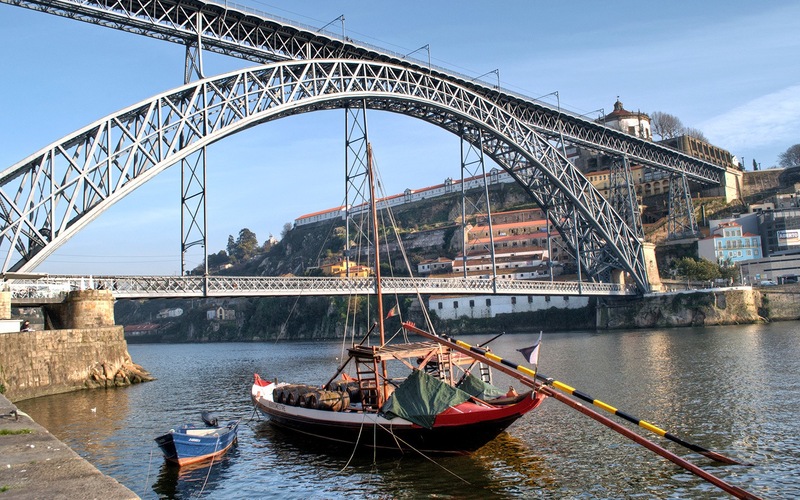 Porto is known as the ‘city of bridges’ and this is one of six linking it to the Vila Nova de Gaia on the opposite bank, where many port lodges are based. The Dom Luís bridge is an imposing sight, whether you’re looking at it or looking out from the top of its 45-metre-high arch. It was built by Téophile Seyrig, business partner of France’s Gustav Eiffel, who’d already worked with him on the similar-looking Maria Pia Bridge in Porto – Eiffel’s last project before his Tower. The bridge stretches over 170 metres between the river banks and was the longest arch bridge in the world when it opened in 1886. 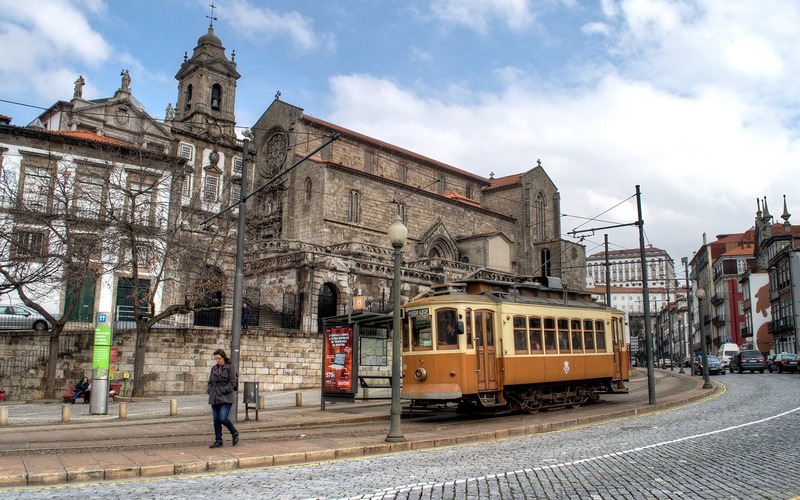 Today the lower level is used by cars and the upper one is used by the metro trains and pedestrians soaking up the views across Porto and Gaia. From the top of the bridge you get a bird’s-eye view down onto the Ribeira with its maze of streets and colourful red-roofed buildings, and I couldn’t wait to get down there to explore it. Near the base of the bridge you can see the Alminhas da Ponte, a shrine to people killed in the Bridge of Boats tragedy. 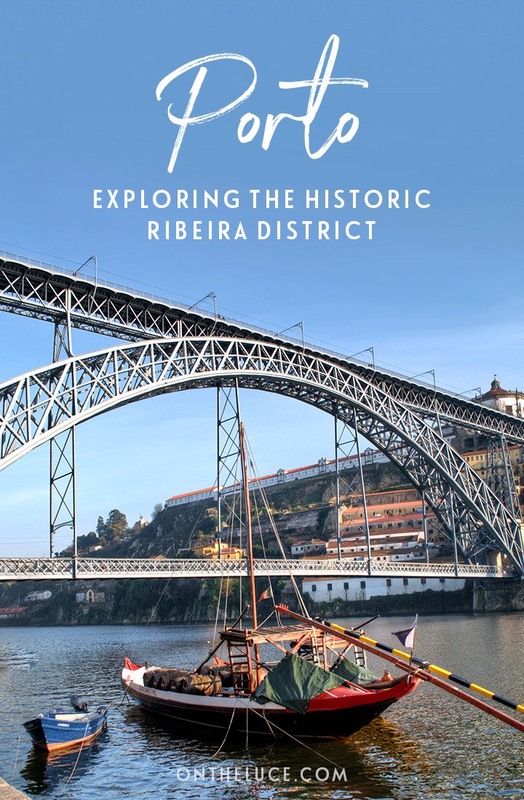 Before the Dom Luís bridge was built, the only way you could cross the Duoro was on a makeshift pontoon made up of 20 boats tied together – known as the Ponte das Barcas or Bridge of Boats. You can still see some of the old bridge’s pillars near the Dom Luís bridge. But when the city was attacked during the Peninsula Wars in 1809, the crush of people trying to escape sunk the boats and up to 4000 people were drowned. On an unseasonably warm, sunny February afternoon, the cafés and restaurants that line the waterfront Cais da Ribeira were packed. 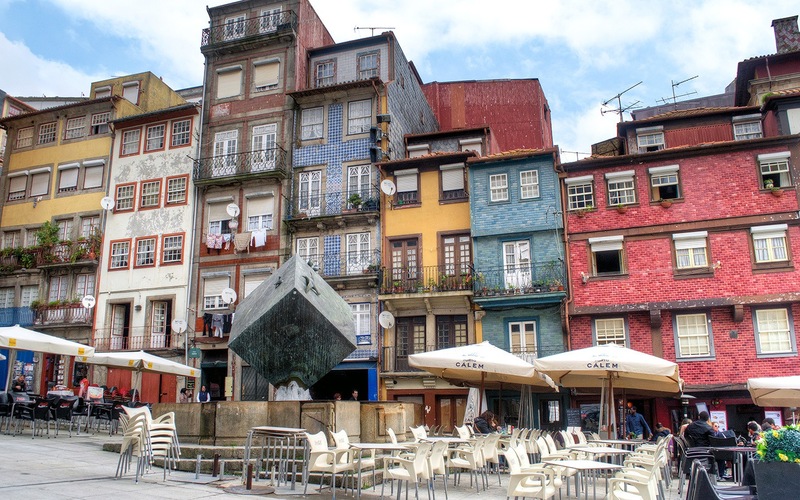 We took a walk along to the main riverfront square, the Praça da Ribeira, which is surrounded by tall narrow buildings covered in tiles glazed in pastel shades of red, yellow and blue. The square is filled with café tables which overflow with tourists by day and party-goers well into the night. But as you move away from the bustle of the square by just a few streets, it’s like you’ve suddenly stepped a few centuries back in time. 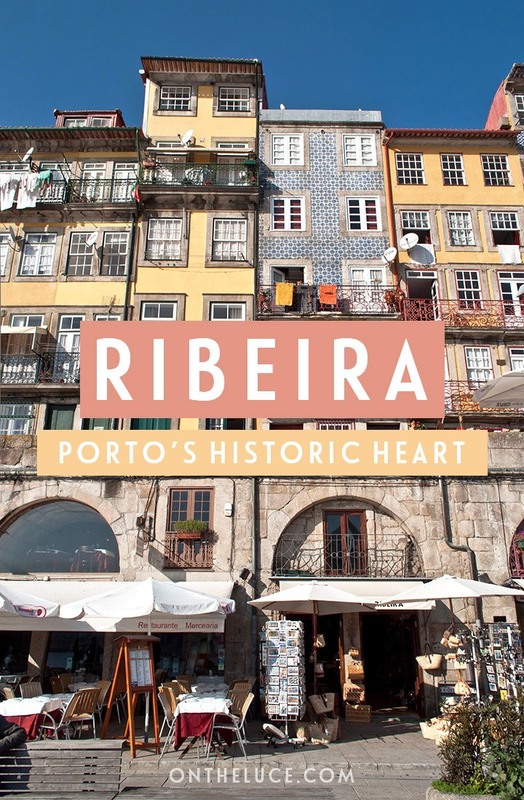 The Ribeira has been Porto’s commercial centre ever since the Roman period, when the shipping port which gave the city its name was set up here. Over the next 2000 years it grew into a major hub for shipments from across the world. Grand warehouses sprung up along the waterside, and it’s the mix of architecture which developed over the years that’s why it’s now listed as a UNESCO World Heritage site. But today the Ribeira has a feeling of decaying grandeur, with the elegant buildings that cascade down the hillside towards the river falling into disrepair. 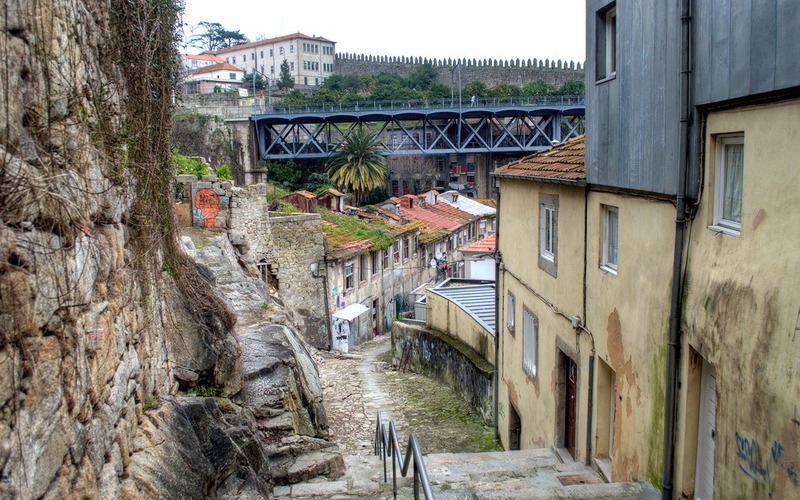 From the Praça da Ribeira, we headed up steep stone stairs which are cut into the hillside. Pathways twist and turn through narrow alleyways and buildings towering above almost block out the light. It doesn’t take long to get completely disorientated, but that’s the best way to see the Ribeira. Many buildings are now deserted, left to crumble as younger residents leave Porto’s old town to live in the suburbs. It’s estimated that a fifth of the Ribeira’s buildings have been abandoned, but there are signs of life even in the most dilapidated-looking streets. Washing lines draped with drying clothes stretch across alleyways, wrought-iron balconies are filled to bursting with plant pots, and there are satellite dishes perched on tiled frontages. And then you come across hidden gems, like a tiny neighbourhood restaurant tucked away down a side street. Or a Baroque church, simple on the outside but draped in ornate gold decoration inside. 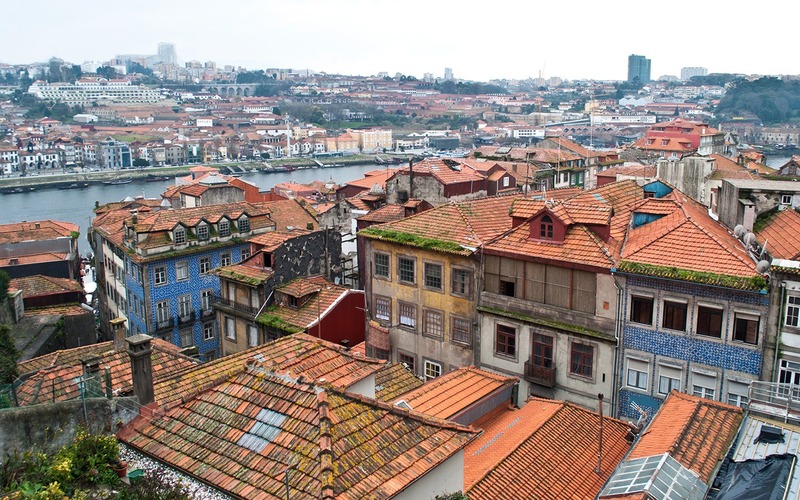 Or a viewpoint where the buildings drop away and you can see out over the terracotta-tiled rooftops across the city, down to the Duoro river and on towards the sea. The Ribeira is also home to the ornate São Bento train station, where flashes of blue and white through the doorway drew us into a huge light-filled hall, covered with floor-to-ceiling blue and white tiles. These painted ceramic tiles or azulejos cover the fronts of churches and houses all across Portugal, but these were some of the most impressive we saw. 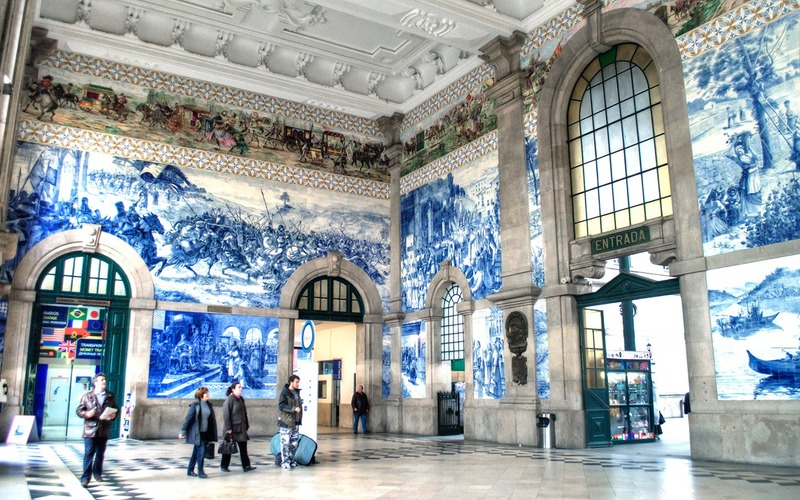 There are over 20,000 individual tiles covering the station walls that make up pictures of battles, coronations and other events in Portuguese history. They were painted by the famous azulejo painter Jorge Colaço, who started work in 1905 and finally finished them eleven long years of painting later. Also look out for the Casa do Infante, the city’s oldest and only royal building where Prince Henry the Navigator was born in 1394. You also come across construction sites, where parts of the Ribeira are being restored and redeveloped. 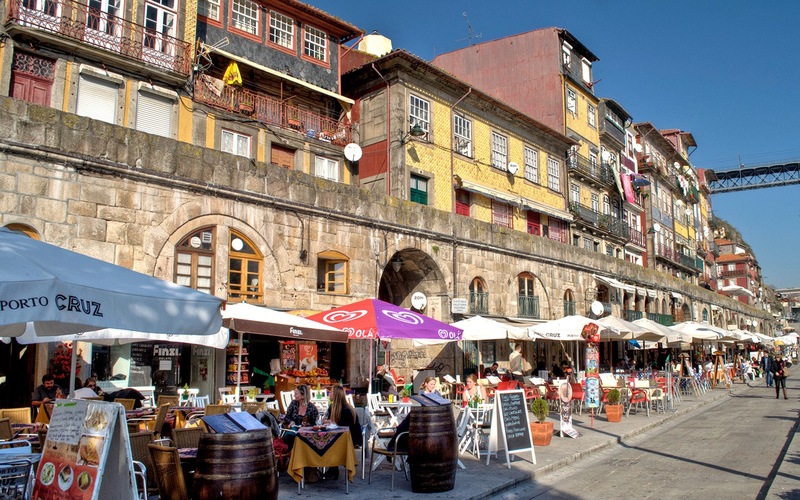 The district’s layout and medieval buildings are being preserved so repairing the Ribeira is a slow and expensive process. But until then its a place to wander and lose yourself – until you suddenly find yourself at the top of the hill back among the people, cars, buses and trams of twenty-first century Porto. 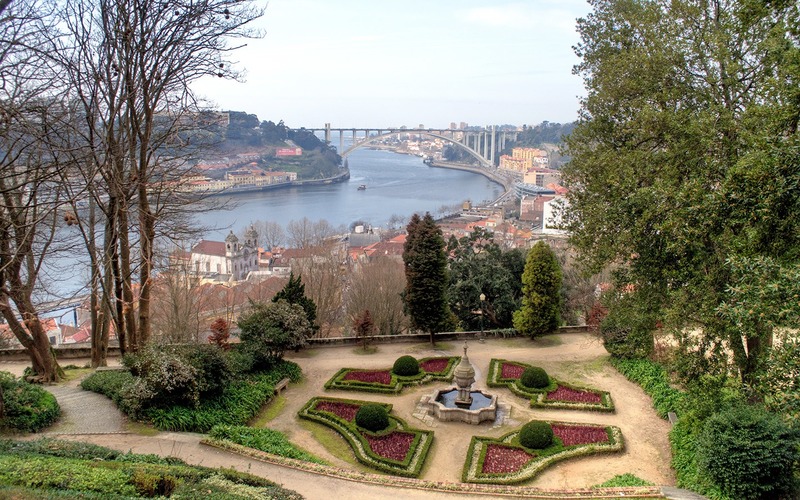 There are a few hotels in the heart of Porto’s old town. At the luxury end of the spectrum the five-star Pestana Vintage Porto is on the Praça da Ribeira, so you couldn’t be closer to the action. A group of colourful 16th-century warehouses have been converted into a hotel, with some rooms overlooking the Dom Luís bridge and Vila Nova de Gaia. Rooms from £175 a night. Or My Ribeira Guest House is only a few minutes uphill from the river. It’s in another historic building, this one dating back to 1834. It has been refurbished in a bright, modern style to make eight bedrooms and one apartment, some with balconies. Rooms from £55 a night. Head to one of the bars next to the Dom Luís bridge for sunset – Bar da Ponte Pênsil has a perfect position right on the water. There are a row of restaurants along the riverside but some of the best are tucked away in the district’s side streets. 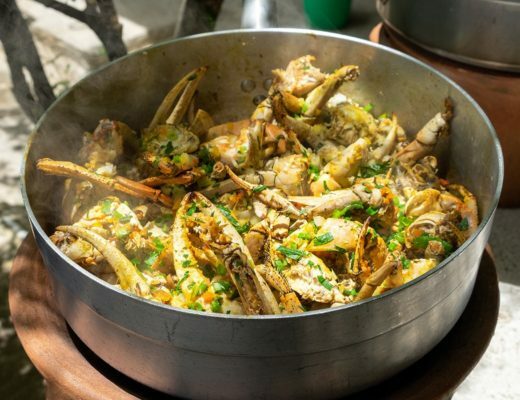 Try Taberna Dos Mercadores for stylishly presented seafood dishes, Escondidinho do Barredo for traditional specialities like fried cuttlefish, or fill up on Portuguese tapas at cosy candlelit Jimão Tapas e Vinhos. Porto has been on my wishlist for a while now, but I think it’s moved a big higher up after this. Would you recommend Porto over Lisbon? Porto was fantastic, though I haven’t made it to Lisbon yet so I can’t do a comparison, but that’s high on the list for a visit soon! Being a Portuguese I’d just like to say to jpilkington09: Porto and Lisbon are very different places! 😉 Different types of things to do/see and different environments, as well. Thank you, glad that I managed to get across a bit of the feel of the city, I really enjoyed my trip and hope to explore a bit more of the area sometime soon. One of my favourite things to do in Porto is wander around the streets, noticing little details and catching unexpected views. 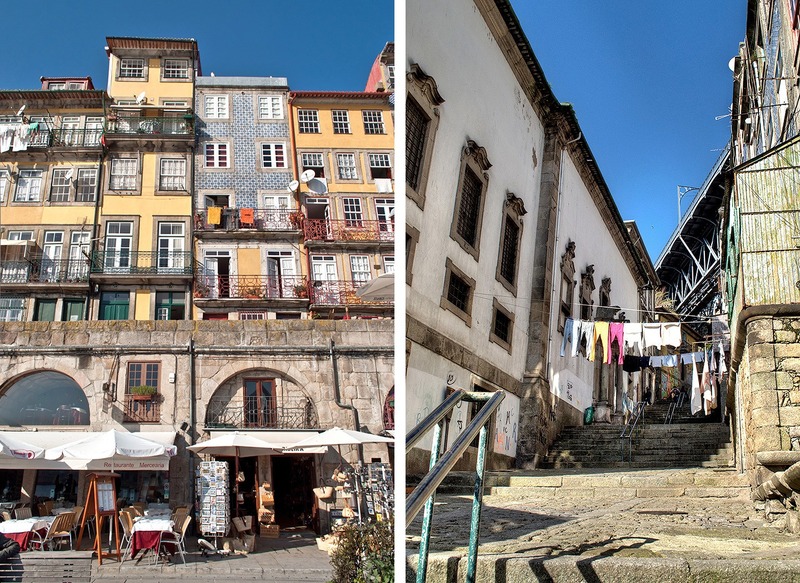 It really is a mix of old and new and full of character, especially in the Ribeira where time seems to have stopped for some of the residents who still use the stone washbasins in the street. When you see the old ladies chatting across their balconies while they hang out the washing it really was like going back in time! Great timing! I am going to Porto for my birthday in June, and only just booked my flight from London. Thank you so much for the post, it is very useful, especially for someone who’s never been to Portugal before. Hope you have a great trip – should be nice and sunny in June too! I preferred Porto to Lisbon but they’re both world class cities. Porto seemed to me a bit smaller and more manageable and chilled for a weekend break. My favourite memory of Ribeira was the local scallies climbing on the bridge and jumping off to impress passers by. I think I’m going to have to take a trip to Lisbon soon to do a proper comparison! Did love the laid back feel of Porto though and as you say it’s a good size for a weekend trip. Some great pictures that reminded me of my two visits there. Thanks. Thanks, it was such a photogenic place I took hundreds and had trouble narrowing them down! Wow.. I never knew about this great place!! beautiful photos! Thanks, it’s well worth a visit, especially if you are interested in photography. I’m off to Lisbon this weekend – it’s my first trip to Portugal and I know I’ll already want to return so I can go to Porto, too. It honestly looks amazing. I love your photos. Have a great time! Look forward to reading about your trip and seeing what you make of Lisbon. 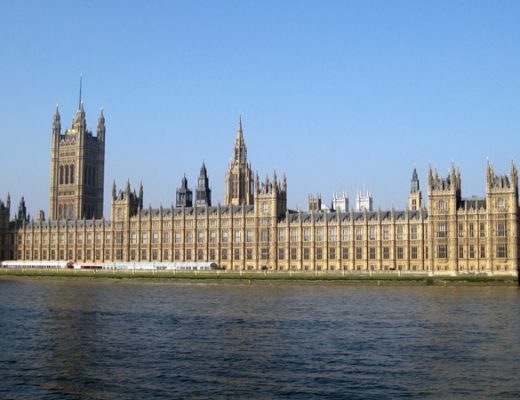 It does look quite similar to Istanbul – another great city! It does look quite similar doesn’t it? I really liked the whole scruffy, faded look of the city. I might be able to visit Portugal when in Spain.But I will not have time for more than one city. Have you been in Lisbon? Which city did you like better? Was Porto defected by 18 century earthquake? Thanks! I haven’t been to Lisbon yet but would really like to next time. I don’t think the earthquake reached as far north as Porto so it didn’t cause any damage here. Lucy, enjoyed this background information and timeless photos. Your post transported me back to a 2003 summertime visit to Porto and Lisbon. In fact, we just enjoyed a vintage bottle of Port that had been aging all this time. I’ll be in Portugal this summer and Porto is definitely on the list. Just not sure how much time I should spend there. A reccommendation? I spent three nights there which was enough for a full day exploring the city and a day port tasting, though you could probably squeeze that into two nights depending on your travel time. Enjoy your trip! I’m heading to Portugal in the fall (among other places) and up until I read your post, really didn’t have any ideas about where to go. Porto is definitely on my list now. Thanks! Great, hope you enjoy it and the rest of Portugal! Nice Post about Porto. It is really a nice City in Portugal, there are many, specially when you visit the old part, as you say, it is really like time has stopped there… Sadly, and considering the hard times Portugal is going through at the moment (financially) I would recommend to explore this beautiful country, and mainly its amazing old city centers, as long as they are this mystic: somewhere between majestic and ruins. I love this country! Thanks I really loved Portugal and have already booked my next trip, to Lagis in the Algarve this October, so look forward to seeing more of the country.